Our Smart Gardening Fair is a free educational event presented by the UC Master Gardeners of Monterey Bay on Saturday, April 13th, 9:00am - 3:00 pm at Jewell Park in Pacific Grove. Sponsored by the Water Awareness Committee of Monterey County, it is a colorful marketplace of “all things gardening” with a special focus on sustainable and water-wise practices! 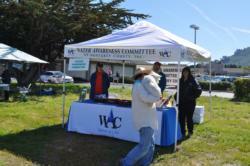 Marketplace and Information Booths by community organizations and gardening-related businesses offering information, goods and services. We have 20 varieties of tomatoes in 1-gallon pots, 4” Green Globe artichokes, peppers, squash, leeks, chard, broccoli, cauliflower, eggplant, assorted herbs, morning glories, delphiniums, pansies, lavender, zinnias, lupine, sunflowers, marigolds, assorted succulents in a variety of planters and 250 - 4” orchids! Thanks to these companies for their support: Renee’s Garden, Baker Creek Heirloom Seeds, Seed Savers Exchange, Johnny’s Selected Seeds, Matsui Nursery (orchids). NOTE: We accept cash, checks, debit, and credit cards at the plant sale. All funds raised will go toward our efforts to offer our low-cost classes and educational events for local home gardeners. A general overview of growing & using the most common herbs for medicinal, therapeutic and culinary purposes. Instructor Susan Hart-Brown is a UC Master Gardener. Interested in adding edibles to your home landscape? It’s easy (mostly) and fun. It’s also good for the environment, your health and your social life! It’s not mysterious or hard to do. Whether you live in an apartment, in a home with a small yard, or a multi-acre property, we will share with you ideas for growing food around your home that you and others can enjoy. Designed for beginners and intermediate gardeners, this course will cover such introductory topics as why to do it, why not do it, how to do it and what to plant. We will incorporate this information into small beginnings such as adding a single edible to your existing landscape, container gardening and creating a 100 sq. ft. edible landscape. Instructor Betsy Allen is a UC Master Gardener who will share her own experiences in creating edible landscapes. In the past two years, Betsy has been gradually converting her urban yard in Santa Cruz from a conventional low maintenance landscape to a bountiful source of fruits and vegetables. Are you thinking of getting some backyard hens this year and want to know what the best breed is for you and your family? Do you want large or small birds, white, brown or blue/green eggs, fancy feathered birds, full-grown hens or baby chicks, or possibly rescue birds from Animal Services? Do you want some ideas about how to design and place a chicken coop? Before you bring those baby chicks home, you’ll want to know how to prepare their first home, how to keep chicks warm, what to feed them, and how to make their transition from a warm house (yours!) to their new chicken coop outside. Candice McLaren is a UC Master Gardener and while no longer raises chickens, she had a bad case of them for over 20 years! Richard will discuss common weeds of the garden, invasive weeds of the coastal area and organic means of controlling weeds. He will answer questions about specific weed issues. Bring weed samples to the class for identification and discussion. Richard Smith is Vegetable Crops and Weed Science farm advisor for Monterey, Santa Cruz and San Benito Counties, California. He has a M.S. in Agronomy from UC, Davis which he received in 1985 and has worked with the University of California Cooperative Extension since then as a Vegetable Crop Farm Advisor. His research and education program includes working with production issues of cool-season vegetables such as lettuce, spinach, Cole crops (Brassica), celery and other leafy greens. His research involves plant nutrition/soil fertility issues, crop production issues, abiotic disorders of vegetables and weed control strategies. He works closely with growers and conducts educational programs, blogs and newsletters. This class will be a primer in what it takes to get into beekeeping. See the bees in action throught the magic of an observation hive. The goal will be to teach students the basics of honey bee biology, what equipment is required and how to find a mentor to guide you on your journey. Learn more about what you can do to help honey bees survive and thrive even if you are not a beekeeper. After retiring from the day to day business world in 2011 I decided to take my vegetable growing and general gardening interest to the next level by applying to the Santa Clara Valley Master Gardener program. During my time in that program I taught or helped teach several summer and winter vegetable classes. I also participated as a member of the Master Gardener radio crew for the monthly Olde Time Farm and Garden Show on KKUP public broadcasting. Finally, I started an average of 300 to 400 pepper plants each year for sale at the Master Gardener’s Spring Garden Market. The objective of pruning is to produce strong, healthy, attractive plants. Carol’s demos provide an introduction to the basics, and proper techniques for size reduction, thinning and other commonly encountered issues. Both perennials and woody plants will be discussed. Samples will be available for guided hands-on practice. Carol Nickbarg is a landscape consultant, Master Gardener and passionate about all things pruning. Anxious to repot your orchids? To find out when to repot, best potting medium to use and additional information check out Master Gardener, Sandi Fox’s presentation, at the orchid potting booth in the Demo area. Sandi Fox is a UC Master Gardener and an avid orchid grower for 30 years. She has grown and repotted a lot of orchids and would like to share some of the things she has learned. Orchids are not hard to grow, they thrive on benevolent neglect. Would you like to know the proper care and sharpening of gardening tools, then stop by and talk to Diane. Would you like to know the name of that succulent? Do you have questions about propagating, potting or care of succulents? 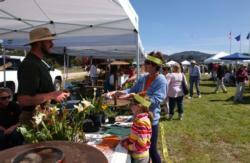 Check out Master Gardener, Tina Heitzman’s demonstrations, at the succulent information booth in the Demo area. Tina Heitzman has been a UC Master Gardener for 11 years. She shares her passion for succulents and their water-wise, hardy and unique growing habits. Composting is easy, this demonstration shows how to easily create the best organic fertilizer, all with the input from your own garden and kitchen scraps. Otis will demonstrate compost in various stages of decomposition and its many applications. He is available to answer your questions on how to build and maintain a successful compost heap. Otis Johnson is a compost enthusiast and wants to share compost consciousness with other people. As a farmer and landscaper, he has a burning desire to expose others to the joy of decomposition and change the way we view waste. Otis is a certified Green Gardener, Master Composter and Master Gardener. Learn how to reproduce your own plants for free using common tools and materials. Easy plant propagation methods such as seeds, stem and leaf cuttings, division, layering and bulbs! These methods will be discussed and demonstrated for you to learn and use in your own garden! Dawn Avery has a degree in Ornamental Horticulture and is a Master Gardener. Dawn also teaches a class on Strawberry cultivation. Enjoy a relaxing walk through the California Native Garden at the Pacific Grove Museum of Natural History. There will be Master Gardeners available to answer questions you may have about California Natives.